Enjoy a Surf Lesson in some world class waves rolling in from the Wild Atlantic Sea at Lahinch Surf School. Let skilled instructors introduce you to the art of surfing. You will learn how to perfect your “POP UP” to your feet in 1,2 or 3 steps! Lessons are held in waist deep water so you don’t need to be an amazing swimmer. The duration of this experience is approx. 2 hours long, 90 minutes of which is spent in the water. Wetsuits and Surfboards are provided. Minimum participant age is 9 years. This experience is weather dependent. Lahinch Surf School is based in Ballyfaudeen, Lahinch, Co. Clare. The surf school operates from February - November. Advance booking on AllGifts.ie is required. Lahinch Surf School is located at the beach hut on Lahinch promenade. Find the Lifeguards towers on the beach and walk a further 100m. On the opposite side of the road you will find our well sign-posted beach hut. This is not to be confused with our postal address. All the action happens at the beach! The town of Lahinch is located in the mid west of Ireland in County Clare, 2km west of the town of Ennistymon. Lahinch is a seaside tourist town with a lot of charm. 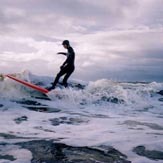 Lahinch Surf School is ideally located offering the closest surfing from the towns of Limerick, Ennis and Galway and with good access from Dublin and Shannon. Founded around Irish surfing Association guidelines, we are the only surf school using completely qualified Irish Surfing Association Qualified Instructors and IWS/RLSI lifesaving qualifications. All our instructors are expert surfers and most importantly, patient and attentive surf instructors. 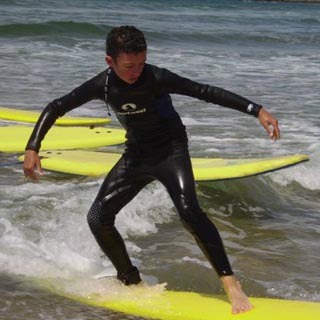 Our founder, John McCarthy has been surfing since the age of 10 and started surfing for the Irish Surf Team at the age of 13 and holds four national titles. John has surfed competitively for Ireland, all over the world, at European and World Surfing Championships and has travelled to Hawaii, Australia, Africa, Central America and Asia to name but a few. Having spent 5 years living and working in Japan after qualifying with a Degree in Science from W.I.T., John decided to retire his office skills for the surf on the west coast. In the first year in operation, John and local surfer Saul Harvey started the first 5 day kids camp and weekend surf courses. Since that first year many instructors have joined Lahinch Surf School. Entirely made up of local Co. Clare and foreign surfers living in county Clare, Lahinch Surf School is the surf school run by real surfers. How it Works: Use this gift voucher on AllGifts.ie to make a booking with Lahinch Surf School. Or you can swap this voucher for any other gift or voucher listed on AllGifts.ie. Simply follow the instructions at the bottom of your voucher. Lahinch Surf School vouchers are valid for 12 months.